It was 17 July ( Revolution day 1968) prior to April 2003,Yet to be replaced by another date. 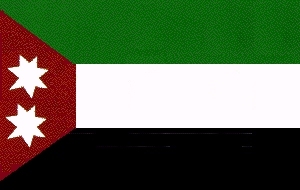 Iraq's first flag was inspired by the flag of the Kingdom of Hejaz, and was in use at the time of independence in 1932. The flag was actually used before independence, from 1924 to 1959. The British occupied Bagdad on 10 January 1919. The allied supreme council created a British mandate on 25 April 1920 and the League approved it later. The British suppressed a major Arab insurrection in July-December 1920. Faisal, deposed king of Syria, arrived in June 1921, and the British proclaimed him King of Iraq on 23 August after a plebiscite voiced 96% approval. The British simultaneously changed the mandate into a Protectorate. 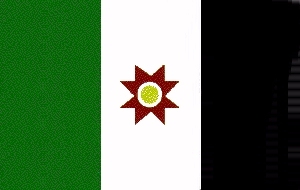 The Iraq flag adopted by Faisal in 1921 slightly changed the Sharifian flag: It was a black-white-green tricolor with a red trapezoid in the hoist and two 7-pointed white stars in the red. The flag was used as national flag and State and civil ensign. It was a black-white-green tricolor with a red trapezoid at hoist containing two white seven-pointed stars. Proportion 1:2. The construction details are given as (2+2+2):12 with trapezoid height being 3. The seven-pointed stars are heptagrams of "sharpness" 1, they are inscribed in imaginary circles whose diameter is not given, but is about 4/3 or so (measuring from the image). The centers of the circles appear to be in the midpoint of the heights from the trapezoid inner vertexes. 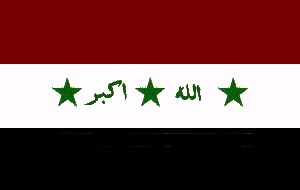 The flag of Iraq that was adopted a year after the revolution of July 1958 is vertical black, white, green. In the white band an eight-pointed star with a white circle in the centre, and in the circle a yellow circle (the sun?). It was in use from 1959 to1963. Ratio 1:2. 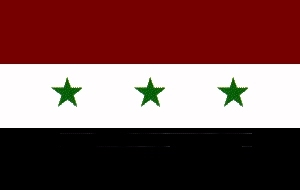 Description: Horizontally divided red-white-black flag with three green stars and the takbir in green placed horizontally in the white strip. The Takbir was inserted in January 13, 1991 by Saddam hussain himself. The hoist of the Iraqi flag should be at the viewer's right, as it is the case for Saudi Arabia and Iran.